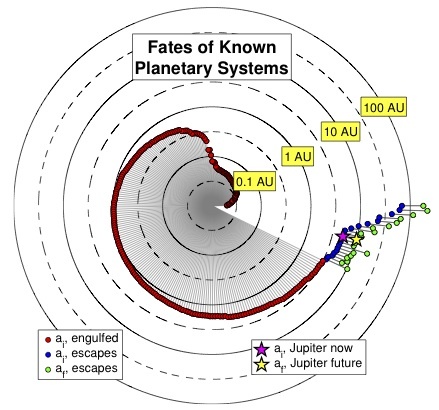 Figure 4: the eventual fates of the known exoplanets. The red planets will be engulfed by the red giant and be destroyed. The blue planets represent the initial positions of the surviving, non-engulfed planets. These planets will move outwards in their orbits due to mass-loss; their final positions are in green. The yellow star represents Jupiter for scale. One of the more exotic discoveries of the exoplanet era has been the discovery of planets orbiting stellar remnants. The very first planets discovered were actually found orbiting pulsars. Substellar objects (objects much less massive than stars but not quite planets) have been found orbiting white dwarfs. White dwarfs are the remnants of Sunlike stars, while pulsars are the remnants of more massive stars. In recent years, scientists have proposed looking for planets around white dwarfs. Such planets would be appealing targets because they are not too much smaller than white dwarfs; an Earth transiting a white dwarf would block out about half its light, a really big change, meaning such planets would be easy to find and characterize. Compare that to an Earth orbiting a Sunlike star, where the change in brightness is only about 85 parts per million! A planet orbiting a white dwarf would have to go through a lot! White dwarfs evolve from stars like our sun. Near the end of its lifetime, a Sunlike star evolves into a red giant, growing orders of magnitude in size and engulfing close-in planets. Even if the planets escape engulfment they have to deal with the matter streaming off the star in the star, as it sheds its outer layers and evolves from a red giant into a very small, very hot white dwarf. 1. How far out does a planet need to orbit (how large does its semimajor axis, a, need to be) to escape engulfment, and what happens to its orbit as the star evolves? 2. What happens to a planet that survives engulfment? Under what conditions might it survive? 3. Suppose an Earth or super-Earth is detected in the habitable zone of a white dwarf. What are the chances that it is actually habitable instead of a burnt-out cinder? Read more: The Fates of Planets Orbiting White Dwarfs | astrobites.